A sales objection handling process with a proven success rate that you can put into practice in just a few hours. I’m a working sales manager and trainer. The selling skills I use with my sales teams have to work in real sales situations. My job and my income depend upon the results my sales teams achieve. Follow this easy to use process to turn objections into sales. Use your own words and phrases to make the process natural and effective. Overcoming sales obstacles with this process is easy because it has only 4 stages. No long complicated list of actions to remember, just 4 simple steps to closing the sale. And because it’s a process, you always know where you are, what to say, and what to do next at every stage. Define the real objection from the buyer’s viewpoint. The issues they perceive may not be real. They could be based upon false evidence or beliefs. You have to be able to see the sales objections from their viewpoint, even if it isn’t real, before you can handle them. I have incorporated many techniques from NLP (Neuro Linguistic Programming) and developed them for this stage of the objections process. The key is to understand that what the buyer believes, and views or hears in their internal mind, is where the real objection lies, and where it has to be dealt with. 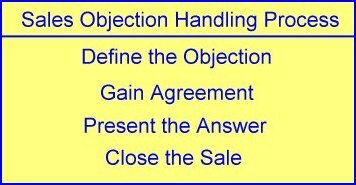 Take a look at Overcoming Sales Objections and see the first stage of defining the objection. Discover where the objection is based. See how to deal with objections and questions that are based on the buyer's map of reality. Imagine a customer that thinks your product is too expensive because they have seen what they believe to be a similar item at a cheaper price. The customer is comparing what they believe are the benefits of your product with the cheaper one. With good questioning skills you can define the real objection as seen by the customer. This could be a false belief about your product and its value to the buyer. The sales objection is not real as your product is better than the cheaper version. The problem exist only in the buyer’s mind, but to the buyer it is very real and will stop the sale if not defined and dealt with. An important step, that many sales people miss out, is to gain agreement to the issue they have defined. For example, you can turn negatives into positives. If a buyer tells you they don’t want a poor service you can turn this into what they do want. Then show evidence that your company can provide an excellent service. They don’t want a product that breaks down. So you re-phrase the objections as, You need a product with proven reliability. It is always easier to sell a positive need rather than a negative the buyer doesn’t want. You have defined the objection, and gained agreement to the definition and to there being no more objections stopping the sale. Now you present your solution and answer the objections. You use features to show the benefits the buyer will gain by doing business with you. If you have used effective questioning skills to define the objection, then the buyer has told you exactly what they need to see and hear to get past the objection. As with the above stages, remember you are presenting to overcome objections that exist in the buyer’s map of reality, not yours. Only present the benefits that will handle the objection. Answer the problems the buyer sees, even if they are based on false evidence or beliefs. Understand what they think and what they need to change their beliefs. You can find more free sales training on presenting features and benefits by opening Handling Objections with a great presentation. Now you can close the sale, or gain agreement to the next stage of the sale. There is no need for trick closes or manipulation techniques. You earlier gained agreement that you had defined the objection, and that there were no more sales objections preventing a sale. That is where the main closing took place. You have presented an answer to the objection that shows the buyer the benefits that will turn the objection into a sale, from their viewpoint. Now all you need is a gentle question to gain their agreement to the sale. 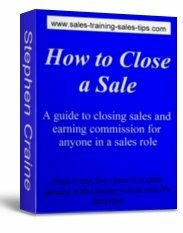 To see more sales training on closing a sale, open Closing the Deal. The above is an overview of the simple, easy to use, sales process that many sales professionals use everyday. Working with my sales teams I have developed this fast and effective sales training course workbook that will have you using this sales objection process in just a few hours. 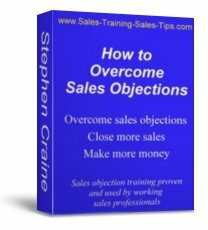 The workbook has 35 pages of sales training on How to Overcome Objections. You get straight into the sales training from page one. No padding, no waffle, just sales training. A complete exercise program that takes you step by step through the process of learning and using the objection handling process. Guides you to select the words and phrases that will work best for you. Includes sales training on how to use NLP to define and deal with the sales objections in the buyer’s mind. Gives you a great sales closing rate compared to other objection handling methods. Used and proven everyday by working sales professionals in real sales situations. Available as an instant download so you can start using it today. A full money back guarantee if you complete the exercises and don’t increase your sales results. So there is nothing to lose, and think what you could gain. A professional sales training course, to turn objections into sales, in a personal training workbook, complete with a step by step exercise program, for just £14.99. Only available from this website. Payments are made via the secure Pay Pal website using credit or debit cards, or a Pay Pal Account. I’m so confident that you will be successful using this workbook course, that I offer a full money back guarantee if you haven’t increased your sales results within 3 months of purchase. All you have to do is return the completed course and I will refund the cost. There is no technique that works on all objections, and with all customers, every time. This objection handling process is the one I have found to be most effective, easiest to learn and use, and has given me and my sales teams the results we wanted. Have you got a question about the objection handling process? Do you want to make a comment or share how you have used the techniques you have found here? To ask a question before deciding to buy the sales training workbook course, move to Questions on sales training on how to handle objections.